Black Bean Pineapple Salad is a colorful dish bursting with flavor. It’s vegan, gluten-free, and oil-free. Try it as a starter or healthy lunch. After creating my Mexican Christmas Eve Salad, I became hooked on adding fresh pineapple chunks to green salads. And the wonderful thing about pineapple is it’s easy to find in the winter since many varieties are grown in the southern hemisphere. 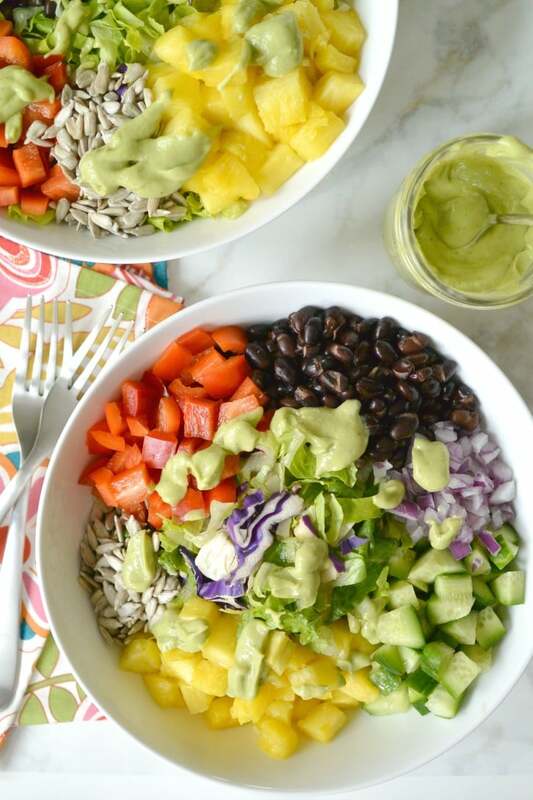 So you can make Fresh Pineapple Salad, Pineapple Mojitos, and now this Black Bean Pineapple Salad any time you please! These days you can buy pre-cut pineapple spears in most grocery stores. Or you can use an inexpensive gizmo to easily prepare the whole fruit. And of course you can simply use a knife, as shown in this tutorial. Besides being delicious, pineapples are a very nutritious tropical fruit. They are loaded with vitamin C, vitamin B-6, potassium, and magnesium. And they contain a lot of fiber. In addition, pineapple enzymes aid in digestion and help reduce inflammation. I’ve also heard they can help with weight loss and boost the immune system. There’s really no reason not to enjoy this sweet-tart fruit! Black Bean Pineapple Salad serves four as a starter or two as an entree. I combined some of my favorite ingredients together, but feel free to use your imagination and make it your own. By the way, the avocado dressing may look familiar to you. In fact, it’s the same dressing that’s featured in my Avocado Quinoa Salad. I love this oil-free dressing so much, I use it on salads a lot. If you have any extra left over from this recipe, give it a try on your favorite salad. It’s also wonderful on a Veggie Burrito Bowl. Now let’s make Black Bean Pineapple Salad! Check out the quick video and see how easy it is to make a Black Bean Pineapple Salad! 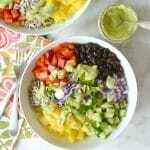 Black Bean Pineapple Salad is colorful and bursting with flavor. It serves four as a starter or two as a main dish. Combine the Oil-Free Avocado Dressing ingredients in a high-speed blender and blend until smooth. Add water by the tablespoon as needed until you reach the desired consistency. 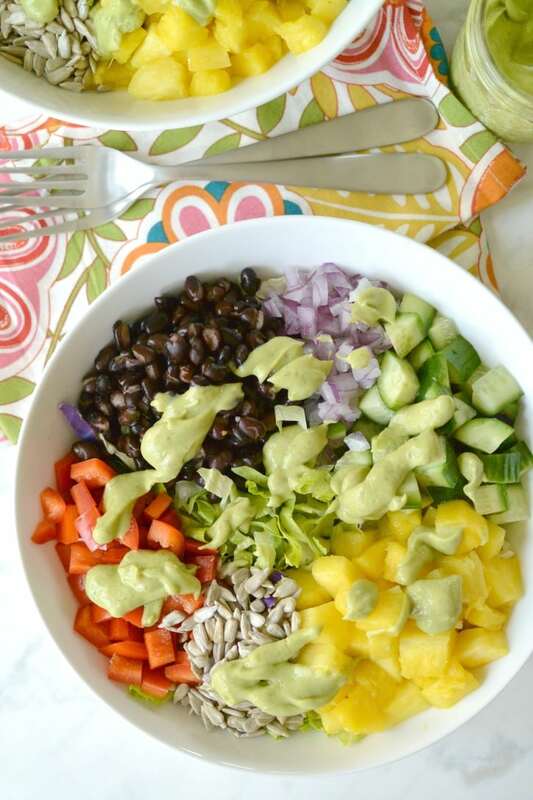 Allow the dressing to chill while you prepare the salad ingredients. 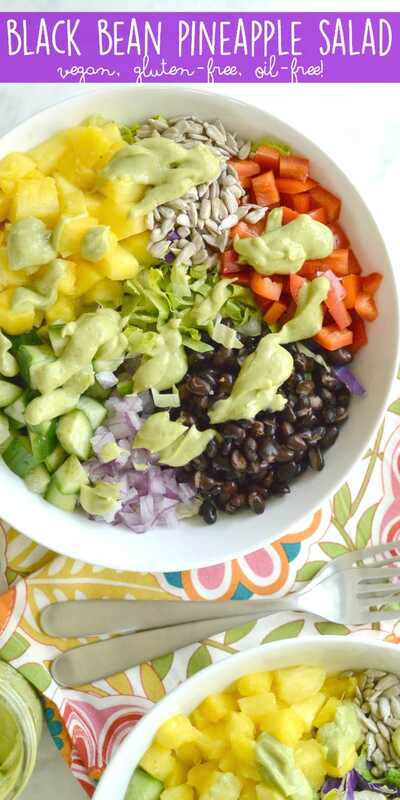 Divide the salad ingredients among two or four bowls. Top each with Oil-Free Avocado Dressing and serve immediately. Nutritional information provided is for an entree-size serving. That avocado dressing is calling my name! I bet it’s heavenly with the pineapple. Thanks Dianne! It is a great combination! AMY! 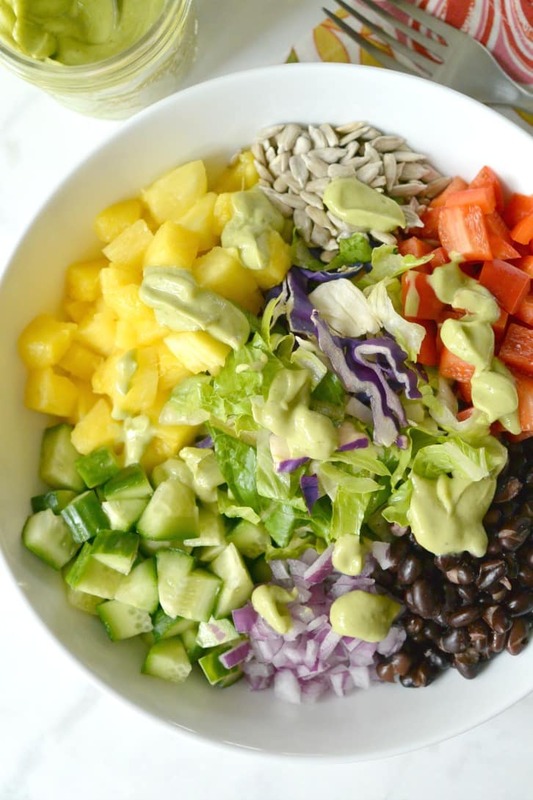 I need to eat this rainbow, ASAP. And that dressing sounds amazing on anything! Thank you, Becky! Yes, the dressing is one of my favorites! I am on the Ornish Hesrt Reversal Program and avocados are not allowed (nothing high in fat, even “good”fats so suggestion on substitute for avocado, please? Hi Janet, I would skip the avocado dressing and top the salad with some coconut vinegar or white balsamic vinegar instead.